Two years ago, Dr. Michael Keiley reviewed a recent landmark study (Learning Early about Peanut (LEAP) Study) which suggested that peanut allergy can be prevented through introduction of peanut-containing foods beginning at 4-6 months of age in high-risk infants. (please see post from Feb. 2015). Prompted by these findings, and in collaboration with 25 professional organizations, federal agencies and patient advocacy groups, recommendations have been added to the National Institute of Allergy and Infectious Diseases (NIAID) food allergy guidelines to specifically address prevention of peanut allergy. Briefly, the NIAID “Expert Panel” (EP) has added three addendums to the guidelines that address introduction of peanut (see Table 1). The three separate recommendations are to address different groups of infants that have a different risk for peanut allergy. The first addendum guideline is for infants with severe eczema, egg allergy or both. For this group the EP recommends evaluation for peanut introduction as early as 4-6 months of age. Early introduction is to reduce the risk of developing peanut allergy (Other solid foods should be introduced before peanut containing foods). The EP recommends that these infants be evaluated for peanut allergy to determine whether or not peanut should be introduced. This can be done with a blood test, skin test or both. Figure 1 shows the recommended actions based on the testing results. We should emphasize that in this high risk group, you and your clinician may want to consult with an allergy specialist to determine how to proceed. The second guideline addendum suggests that infants with mild-to-moderate eczema should have cautious introduction of age-appropriate peanut-containing food around 6 months of age. (Other solid foods should be introduced before peanut containing foods). While this introduction can be done at home, we would recommend you discuss it with your primary care clinician. He/she may recommend an in-office supervised feeding, evaluation, or both. The third guideline addendum is for infants without eczema or any food allergy. The EP recommends age-appropriate peanut-containing foods can be freely introduced with other solid foods, in accordance with family preferences and cultural practices. However, the EP makes the point that early peanut introduction would probably be more beneficial than later introduction in these lower risk infants. The participants in the LEAP Study ingested approximately 6 g of peanut butter per week in 3 separate meals. This would be 2 teaspoons of peanut butter 3 times per week. Caution: Be aware of choking risks. The EP recommends that “whole nuts should not be given to children less than 5 years of age” and that undiluted “peanut butter directly from a spoon or in lumps/gallops should not be given to children less than 4 years of age.” For low risk infants receiving peanut butter at home for the first time, the EP recommends diluting 2 teaspoons of peanut butter with an equal volume of hot water, or pureed tolerated fruit/vegetables. A small part of the peanut serving should be introduced initially on the tip of a spoon, and 10 minutes later, if there is no allergic reaction, the remainder can be given at the infant’s usual eating speed. There should be a 2 hour observation period afterwards. 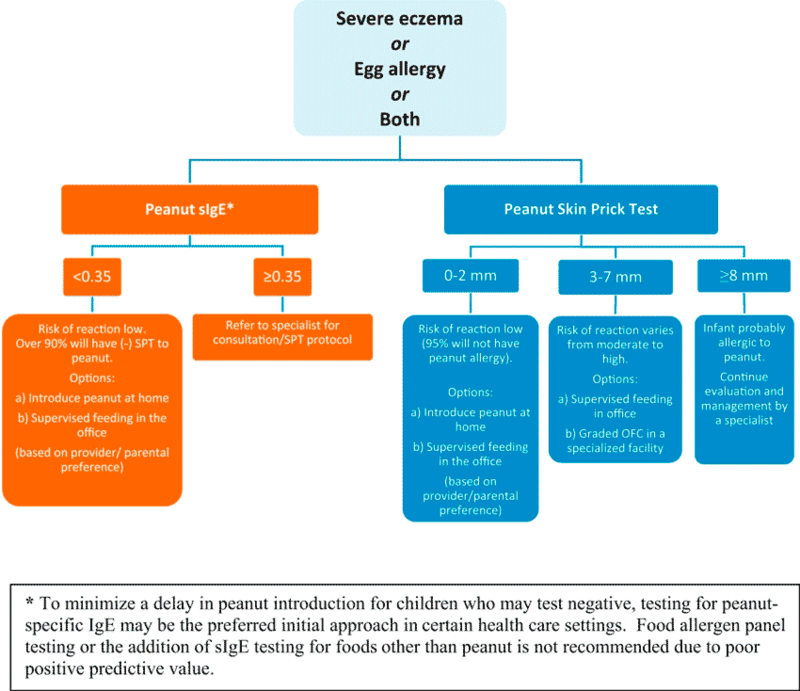 If your child has severe eczema, egg allergy or both do not introduce peanut containing foods without having the child evaluated. If your child has had any previous reaction to peanut, do not offer additional peanut containing foods without having the patient evaluated. When in doubt, talk to your primary care clinician first! 1. Du Toit, G. et. al. Randomized trial of peanut consumption in infants at risk for peanut allergy. N Engl. J. Med 2015;372:803-13. 2. Togias, A. et. al. Addendum guidelines for the prevention of peanut allergy in the United States: Report of the National Institute of Allergy and Infectious Diseases-sponsored expert panel. Journal of Allergy and Clinical Immunology. Downloaded from jacionline.org on February 28, 2017.